So What the Hell Is Ragnarok, Anyway? Image: Marvel Comics. Thor #85 art by Andrea DiVito and Laura Villari. This week, Thor: Ragnarok hits theaters—but its titular apocalypse is more than a casual allusion to the Norse mythology that Marvel’s hero originates from. It’s a reference to an event in the comics that has hounded the God of Thunder since his adventures first began. Here’s everything you need to know about it before you go see the movie. In the real world—well, as real as a mythological event described in a 13th century anthology of poems called the Poetic Edda can be considered real—Ragnarök is the portended death and rebirth of not just the Norse pantheon of gods, but the entire world. In it, a series of natural disasters and battles caused by the writhing of Jörmungandr the World Serpent leads to the downfall of the gods and Surtr, a giant fiery troll, engulfing the world in flames. Odin gets eaten by the giant wolf Fenrir, Thor falls in battle defeating the World Serpent, and once everything’s been turned to ash, a new, fertile world takes the place of the ruined one, with the human population being kickstarted by the Nordic answer to Adam and Eve, Líf and Lífþrasir. Meanwhile, new gods and reborn versions of old ones eventually return. Marvel’s version of Ragnarok in the comics is likewise a cyclical event of destruction and rebirth, but with some subtle tweaks. Like the prophesied Ragnarök, it is meant to have occurred many, many times throughout the history of the Marvel Universe—but unlike our Ragnarök, it’s much smaller in scale, as it only affects the realm of Asgard itself, allowing new incarnations of Asgardians to live out a new cycle. It does borrow a lot of elements from the Norse Ragnarök—it includes the grand battle in the form of Loki invading Asgard with an army of Frost Giants. It includes Heimdall announcing the beginning of the apocalypse by sounding a horn on the Rainbow Bridge. It includes Thor battling, and defeating, the World Serpent (Jormungand, commonly referred to as the Midgard Serpent). It also includes Thor’s victory being too late to stop Surtur, the demon-esque entity from the hellish realm of Muspelheim, from ravaging what’s left of Asgard in eternal flame. At which point, after a passage of time, the denizens of Asgard are born again to establish a new cycle. In the comics, two cycles of Ragnarok have occurred within the last two thousand years. The first, around the time of Jesus Christ’s birth on Earth, is actually the kickstarting of the generation of gods we know as the current denizens of Asgard. The story of this Ragnarok is retold by Roy Thomas, Keith Pollard, Chic Stone, and Carl Gafford in the pages of Thor #293 and #294 in 1980. Some things go down differently than previous cycles however, like Odin being eaten by the giant wolf Fenris (exactly like Fenrir in Ragnarök) and Thor dying from the venom of the Midgard Serpent. But Asgard falls the same. What also happens is that the generation that replaces them finds relics of the previous cycle, discovering the old generation of gods and learning about the nature of their death and rebirth. This allows the reborn Odin—who, weirdly enough, is formed out of the surviving brothers and sons of the previous cycle’s Odin—to attempt to alter fate and keep the current cycle going as long as possible. It’s why when we meet Thor in Journey into Mystery #83 back in 1962, he’s exiled on Earth to live the dual life of the God of Thunder and medical student Donald Blake—because Odin believed that the very presence of Thor among the gods would help bring about Ragnarok again. It’s also why the Asgardians basically freak out whenever Loki concocts one of his villainous schemes, because there’s always a chance it could be the event that brings about his invasion of Asgard and the end of all things (again). Over the years since his introduction, Thor has managed to delay Ragnarok a few times, but it actually ended up occurring in 2004, as part of a run-up to the widely-vilified, continuity-busting Avengers: Dissembled event that would lay the groundwork for Brian Michael Bendis’ run on Avengers. And, in even weirder circumstances, it occurs after a totally crazy plotline where Odin dies fighting Surtur, and Thor takes over as the ruler of Asgard, only to go crazy with power, extend Asgard’s rule to Midgard, and spends the next two centuries being a power-mad king... only for him to go back in time and eventually reset the timeline to what it once was. Almost immediately after the timeline reset, Loki starts Ragnarok by reviving Surtur, finding the original mold that created Mjolnir, and using it to make a whole stash of lesser, but still powerful, copies. Loki invades Asgard, tons of people die, and Ragnarok begins once more. But Thor goes on a quest to see if there is a way to stop it before Asgard is fully destroyed, and eventually sacrifices his eyes at the Well of Mimir to learn the wisdom of his fallen father—and discovers that there is actually a pantheon of gods that sits above the Asgardians called “Those Who Sit Above in Shadow” who perpetuate the cycles of Ragnarok to feed off the energies released by the destruction of Asgard. Thor realizes that his father’s plan for him was to actually end the cycle of Ragnarok altogether, but to do so it must happen one more time. So Thor returns to Asgard and lets Surtur destroy it, while he goes to cut up the Loom of the Fates, separating Asgard from Those Who Sit Above in Shadow. Everyone dies and Asgard is destroyed, but the cycle of Ragnarok is ended forever. Meanwhile, Thor goes into a sort of hibernation while his friends on Midgard believe he is missing, presumed dead. So on the bad side, Thor and everyone he knows is gone. On the plus side, Thor gets to miss out on Civil War. Although, to make matters even more confusing, Tony Stark creates a clone of Thor called Ragnarok during Civil War that goes mad and kills size-altering hero Goliath in a battle between the pro-and-anti-registration forces. Totally unrelated to actual Ragnarok, though! The Thor comic actually went on hiatus for three years after the Thor: Disassembled plotline, and upon his return at the start of a new volume of Thor in 2007, the returned God of Thunder is tasked with rebuilding Asgardian society. He starts by bringing Asgard to float above the skies of Broxton, Oklahoma, and discovering that the reborn versions of the Asgardians for this new generation have been imbued into random humans across the world, requiring Thor to re-awaken them. He does so eventually (with a few bumps in the road, like a mysterious force going around killing the human god-hosts in an attempt to stop Asgardians from being reborn), giving us the Asgard we have in the comics today, renewed and free of the endless cycle of death and rebirth—oh, an back in its own realm instead of hovering over the Midwest. What we’ve seen of Thor: Ragnarok so far indicates that at least some elements of the comics’ take on the Asgardian apocalypse will be different—not least because the movie is seemingly also smashing bits of another comic book plotline, Planet Hulk, into proceedings. 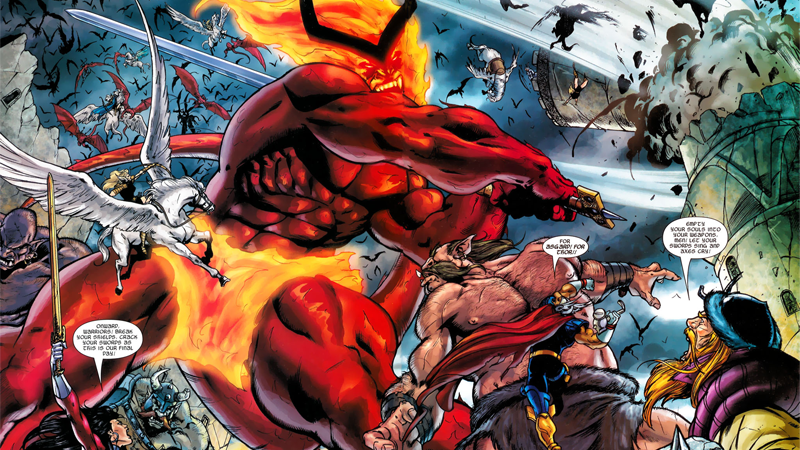 While we know some elements are in there, like Surtur, Fenris the Wolf, and even an invasion of Asgard (lead by Cate Blanchett’s Hela, the Goddess of Death, rather than Loki), how apocalyptic it truly ends up being remains to be seen—but at least it should be less complicated than the Ragnaroks of the comics.